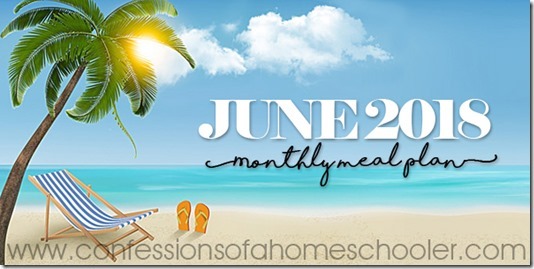 Hi friends, We’re in full summer mode here at the Confessions household, and that means it’s time for my June 2018 Monthly Meal Plan! –>> For more fun recipes, visit my Recipes Page! If you haven’t already used this before, you can click on any of the underlined menu items to get to the recipe. I like to shop once a week, so I just make a list off of my menu plan and head to the store. I find that I spend less when I shop off of a list, then flying by the seat of my pants. I also end up with ingredients that will actually go together instead of a bunch of random items that don’t amount to anything. I just bought your book and I feel that you are very misleading about it .it is the same menu for twelve months .so I paid for the small menu printed over and over .why would you do that .no one would buy it if they new this .I feel you are deceiving people with this book to make money .I am very unhappy with your book busy mom’s guide to home cooked meals.it not a book ,it’s ajoke. I love homeschooling my two. We are currently looking online for a decent homeschool curriculum pack to use with them. Preferably a cheap one. Also I love your meal plans may I steal them and adapt them to my family’s culinary skills and preferences as well? 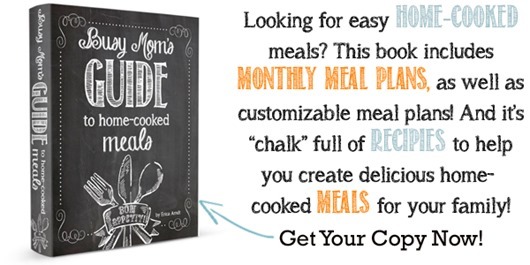 Hi Leah, the meal plans are available in an editable word doc, just click that link in the post. I just ask that you do NOT adjust them and then re-post them as your own on a blog or website. But you’re welcome to adjust them to fit the needs of your own family and use at home!